For the first time this season, the Edmonton Oil Kings failed to win a game when leading after 40 minutes. Trailing 2-1, the Brandon Wheat Kings (24-2-3-4) scored four times in the third period en route to a 5-2 win over the Edmonton Oil Kings (30-17-4-4) in front of 2,737 fans at Westoba Place on Wednesday night. After a back-and-forth opening frame, defenceman Conner McDonald gave the Oil Kings a 1-0 lead, from Wyatt McLeod and Scott Atkinson, at 17:37. It turned out to be the lone goal of the opening frame, of which the Oil Kings outshot the Wheat Kings, 10-5. Just 1:55 into the second period the Wheat Kings made it a 1-1 game, but overage forward Vince Loschiavo would give Edmonton back the lead, 2-1, with his 26th of the season, assisted by Quinn Benjafield and Vladimir Alistrov, at 17:25 to close out second period scoring. Shots on goal through 40 minutes of play favoured Edmonton, 24-13. The third period didn’t get off on the right foot for the Oil Kings, as Linden McCorrister netted his 13 of the season via a shorthanded goal only 26 seconds in, making it a 2-2 game. Just over six minutes later Luka Burzan gave Brandon their first lead of the night at 3-2, before Stelio Mattheos made it a 4-2 game at 13:01 of the third period. 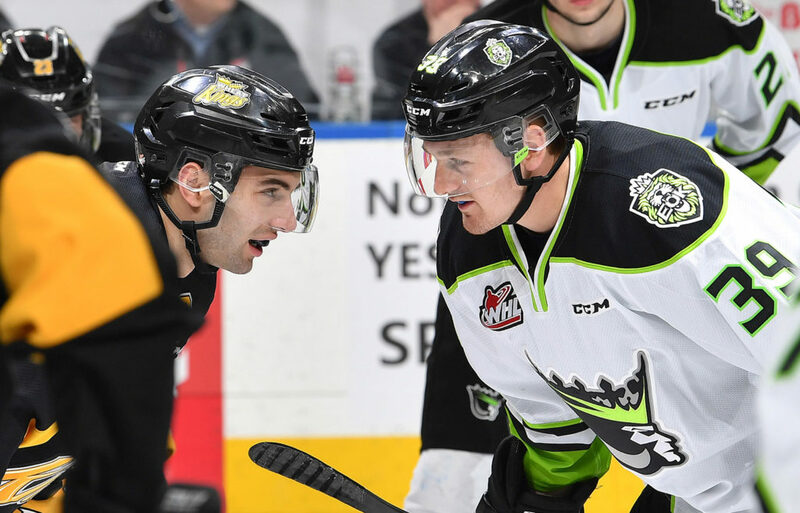 With Myskiw pulled in favour of an extra attacker, the Oil Kings strived to edge closer but instead the Wheat Kings added to their lead and solidified the win with 17 seconds remaining on a goal by Connor Gutenberg, to secure the 5-2 final. Brandon was 0-for-2 on the power play, while Edmonton finished the game going 0-for-3 with the man advantage. Linden McCorrister (BDN) (3), Jiri Patera (BDN) (2), and Stelio Mattheos (BDN) (1) were selected as the Three Stars of the Game. The Oil Kings continue on their road trek of three games in three days tomorrow, Thursday, February 14, when they take on the Moose Jaw Warriors at 7:00 PM MT (6:0 PM CT).